A while back my friend and I came up with the brilliant concept of a book called 'Cooking with Baby'. It was inspired by the Family Circle and Food Network's cooking with kids week. However, you see it was not about cooking with baby, it was about cooking with baby. Like in baby as an ingredient. There, all you people with a soul just twisted your noses up in disgust. One of you pure minded people must have said a little prayer that I cook in hell fire for such a horrible inhumane idea. Jesus! You really would not skewer a baby and stick it in the rotisserie would you. I'm not sure if I pity Jonathan Swift more for the criticism he endured or the people who took 'A modest proposal' seriously. The frustrating thing is that most people just don't get sarcasm and the likes or they take it too seriously. Irony is the greatest weapon of rhetoric, and sarcasm is the sharpest blade in it's armory. Its a beautiful blade actually. Very small, very simple, extremely delicate and intricate. Unlike most weapons, sarcasm is not really to kill or severely wound. Its a quick sharp slice that merely reminds people of a simple little fact 'sharp objects cut'. A lot of people get offended by sarcasm or take it as an insult. Some people take it that sarcastic people are being pig headed and obnoxious. Then there are the wannabes who think you are being sarcastic when you ask for a glass of water. Haha yeah right, you were soooo thirsty right, that you just had to ask for water. 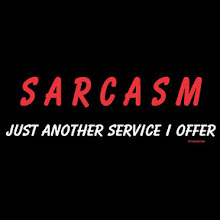 Anyways, sarcasm ought to be taken for what its worth. It is a means of pointing out the absurdities in our life. A way of forcing us to rethink the way we think and reimagine the way we perceive the world. Stop taking it literally. I call it the cake or death test in honor of Eddie Izzard, but its a test that I devised during my tenure as a supervisor to identify worthy people. Ask them "Can I poke you in the eye, with my pen?" The average human will react why, or tell you to stop being ridiculous, some may argue with you. If you are exerting authority like I did in my position, people will accuse you of abusing authority. Worthless simple minded people these lot are. As Mr. T would say, I pity the fool. Here are three answers that I thought were gems, and highlight people who are worthy. "Ok" That which yields is not always weak. The one who will willingly allow you to cause them harm, is a fatale to be watch for. "How do you propose to get past my glasses" Awareness. One must be aware that people are not always capable of doing, what they propose to do. Don't judge the bite by the bark and vice versa. "If you do that, I will ruin your teams performance stats?" Comeback. You can always renegotiate a status quo. No one is powerless, and there always is a bargaining chip. Its not whether you choose cake or death, its how you can overcome dichotomies. As Kirk would say, there is no such thing as a no-win situation.